Apple would really like you to know that its products are the gateway to a happy family. On Thursday, the company launched a new page on its website dedicated to families. “You want to do what’s best for your family,” the page reads. “So do we,” it affirms. Apple’s new page is a breakdown of all the ways parents can control and tailor their kids’ experience on Apple products. The page details a bunch of different Apple features and products that apparently help you “be one big happy, healthy family.” And not all of them signal a bleak future in which kids have an unhealthy relationship with technology. For instance, Apple points out how the iPhone’s Do Not Disturb While Driving feature ensures users don’t get distracting notifications while they’re on the road. But some of the listed perks and features don’t read as decidedly positive. One subhed—“Know where your kids are, 24/7”—details all the ways parents can constantly surveil their children. While not explicitly insidious, constant reconnaissance doesn’t necessarily read as the behavior of a happy and healthy family. Apple hasn’t shared its motivations behind this new page (we’ve reached out to Apple for more information), but it’s not coming out of nowhere. It follows an open letter from investors that raised concerns about technology’s harmful effects on children. “There is a developing consensus around the world including Silicon Valley that the potential long-term consequences of new technologies need to be factored in at the outset, and no company can outsource that responsibility to an app designer, or more accurately to hundreds of app designers, none of whom have critical mass,” investors wrote, urging Apple to figure out better approaches to parental control options. 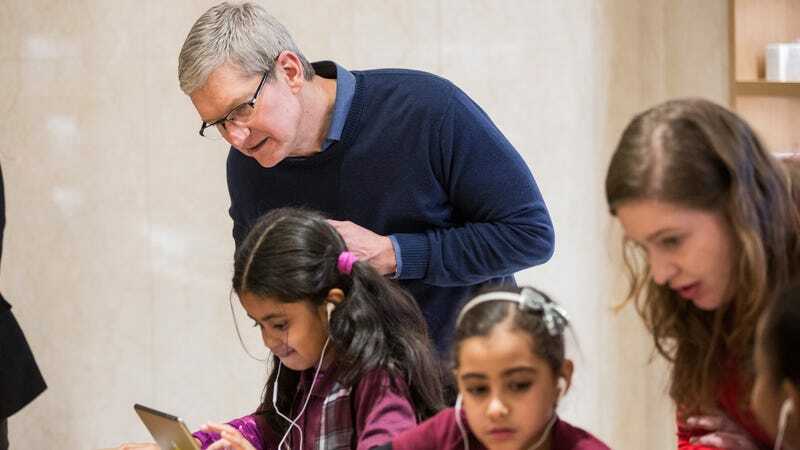 On Apple’s new page, the company says it is “continually designing new features to help make sure kids use [Apple products] in the ways [parents] want.” However, the page itself reinforces an argument that some Apple investors (and possibly many parents) don’t appear to agree with: that Apple’s products are already good for kids and parents. The page implies that this is a communication problem, and that with good PR Apple can set the record straight. It’s not a Bad Thing for Apple to detail all of its family-centric features in one hub. And it would be financially disadvantageous for Apple to outright encourage people to spend less time staring at iPhones and iPads. But it’s still hard not to see the irony here. Like most tech companies, Apple’s solution to all of our tech problems seems to be... more tech.